The Indigenous Students Health Sciences (ISHS) office is solely dedicated to providing services and supports for the academic success and wellbeing of all First Nations, Inuit and Métis students in the Faculty of Health Sciences at McMaster. Examples of our programming include Elders in residence, mentorship, graduate/professional development, student leadership, and community collaborations. 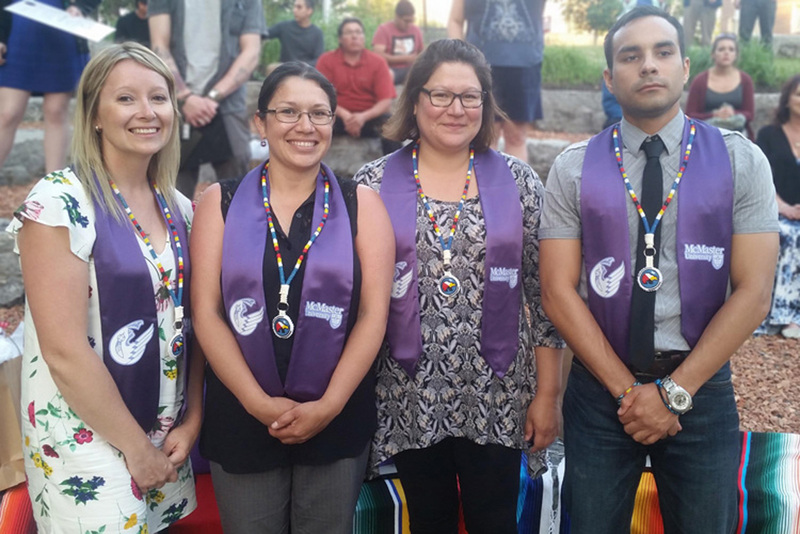 ISHS also engages with broader Indigenous communities and knowledge shares with non-Indigenous students, staff, faculty, and departments interested in Indigenous health. Improved relationships between the university and local Indigenous communities. Create an inclusionary environment for First Nations, Inuit, and Métis students within the university that includes infusion of First Nations, Inuit, and Métis specific content into all health sciences program curriculum. To promote greater enrolment and success of Indigenous students in order to close the gap between Indigenous and non-Indigenous learners in university. To support Indigenous students in their academic achievements through mentorship and providing them with a culturally meaningful education. To promote a culturally safe, racism free learning environment for Indigenous students across campus. To increase awareness of Indigenous issues at the university level. To serve and respond to the social, cultural, and economic needs of Indigenous learners and communities. To enhance Indigenous governance within the university. To recruit and assist Indigenous students in access and success at McMaster. To engage with Indigenous secondary students to assist in the transition between high school and the university environment. To increase and enhance Indigenous students’ services on campus. To provide and maintain the Elders-in-residence and Indigenous Mentor Program. To increase and promote Indigenous faculty within the Health Sciences. To work collaboratively with Indigenous communities in the development of Indigenous programs, curriculum, and services. To increase awareness of Indigenous cultures and issues among university faculty and staff in order to increase cultural safety university wide.